The Book Zone (for boys) chose Hattori Hachi: Stalking the Enemy as their Book of the Month - that made me very happy! Thanks The Bookzone (for boys)! 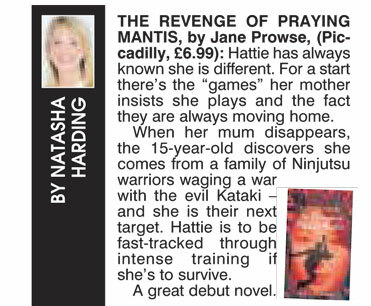 And Moira Briggs of Vulpes Libris chose Hattori Hachi: The Revenge of Praying Mantis as one of her top two books of 2009! Thanks, Moira! TeenLibrarian (February 2012) - scroll down to pages 4-5 to read "Eight Questions With ... Jane Prowse"